• Bring 4 2/3 cups water to a boil in a pot or microwave in a four cup Pyrex measuring cup (it will fit the extra 2/3 cup) or other microwave safe bowl. Once the rice is in, put the bowls on the stove to warm up and cut up the broccolini in roughly 3 inch pieces. Discard (or compost) any really woody ends. Set aside until you get the salmon in the pan. Prepare the pot and steamer. Add about a cup to cup and a half water and set on low. Why a bowl? You can use any kind of dish, but I like a bowl. I like to cup my hand around the bowl while I’m eating to share a little of the food’s warmth with my hands. The best part is at the end: holding the bowl helps you get every last bit out. Also it’s easier to make food look nice in a bowl. 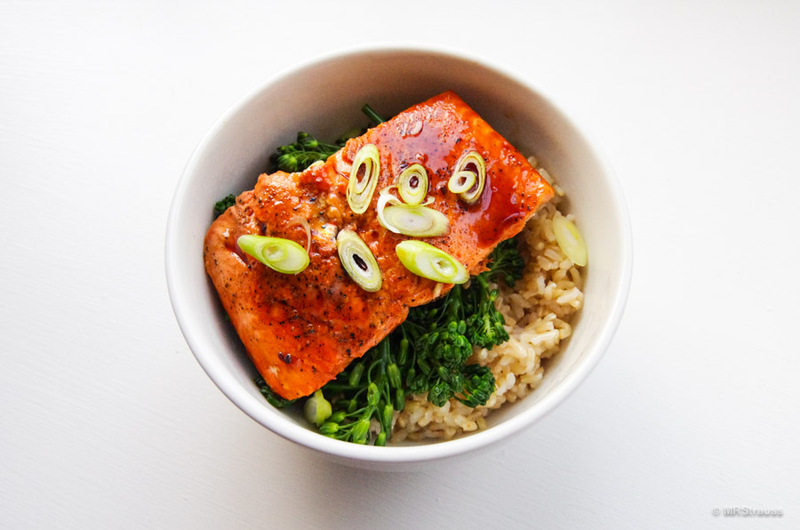 This entry was posted in Bentosh and tagged Broccolini, Brown Rice, Salmon on October 30, 2016 by mrstrauss.